The Peanut Power Sprint is sponsored by the North Georgia QRP Club. It is only two hours long and is concentrated fun. This is the second year for the sprint. I decided to enter the Goober category again. That is one watt or less portable. The curious thing is at 1 watt I do better in this sprint than any other. The weather was no fun. It was overcast with a light drizzle. My set up was the KX3 and a 40/20 meter fan dipole. At one watt it is not the time for a compromise antenna. I do have some advantage as I am in NVIS range for Georgia stations and there are a lot of them. The funny thing I had more contacts but a lower score than last year as I had fewer S/P/Cs. Perhaps I should have spent more time on 20 meters to reap more SPCs. The lesson to me is that one watt is plenty power. I only had one QSO that they struggled to copy me. It just helps that 100 stations are clamouring to work you. Oh yes, it was nice to contact Larry W2LJ in NJ. His famous blog is http://w2lj.blogspot.com. Also fellow RaDAR operator Myron WV0H had 41 contacts as a Goober. I think he will take first place. There were 3 31 foot poles and two 20 foot poles for the 40/20 fan dipole. Thursday PM: With the prospect of a stormy weekend I left work early and headed to St Andrews State Park. There is a spot facing Grand Lagoon that has a picnic table. I picked that spot to locate the Bravo 7K. I had a good run of contacts on 17 SSB. I was running 100 watts with the Icom 7100. I had DX including France Italy and Columbia and NM, TX and AZ state side. This was followed by a run on three Maryland stations and West Virginia. These four were on a line directly across the Lagoon. Was that the salt water effect? I had many good reports. St Andrews State Park next to Grand Lagoon The Bravo 7K is set for 17 meters. Saturday PM: I initially set up the Bravo 7K on 10 meters to try to contact Eddie ZS6BNE. He was getting RBN spots in the USA. We gave it a good try but no joy. Well as long as the Bravo 7K was setup in the front yard I took advantage of the opening on 10 meters. I also chose to use the KX3 at 8 watts. Here are my contacts. That was fun! I was getting S5 up to S9 reports and really no struggle to get through. I think the low angle of 20 degrees was in my favor for DX. My front yard. The Bravo 7K is set for 10 meters. It breaks down to fit in a bag about 3 feet long. There is no tuner required as the SWR is under 2 to 1 for 40 through 10. It is broadband. I can use it for QRP or QRO. It is self supporting as the tripod is included. I got the leg extensions for the tripod. I don't need any poles. The tripod legs adjust for uneven ground. You set it for the desired band but you do not have to do any tweaking or tuning after that. Of course, I do have to acknowledge that it weighs about 12 lbs. It does take about 10 minutes to setup. It takes about 3 minutes to change bands. By its design it is not a NVIS antenna. I am very pleased with this antenna. You may know I am pleased with many antennas. I also like the AlexLoop, various end fed wires and yes the dipole. The fun is picking the one for your portable situation and operating goals. I definitely want to do more testing of the Bravo 7K on the beach and bay side. There are a number of articles on the salt water effect for vertical antennas. The salt water can bring the take off angle from twenty degrees to almost zero degrees. See N6BT.com Perhaps I can take advantage of the salt water effect to work Eddie ZS6BNE and other DX RaDAR operators. My Initial experience with the N6BT Bravo 7K Vertical Dipole. I read Tom Schiller's book Array of Light. 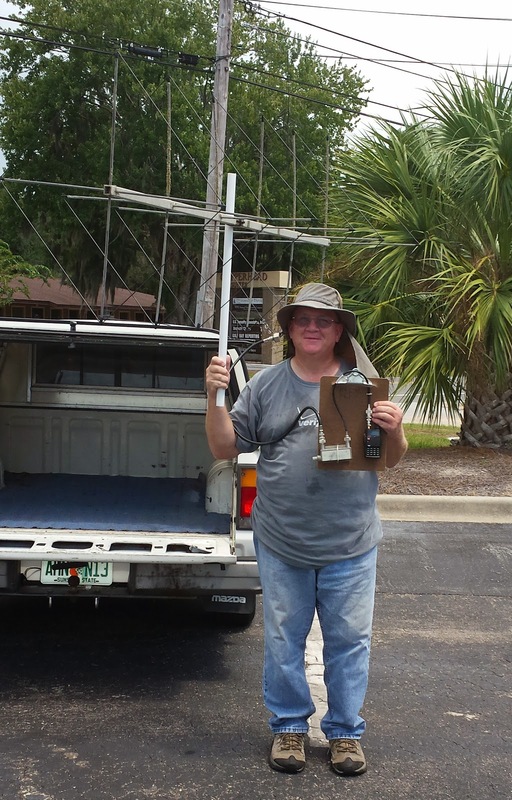 In Array of Light, Tom N6BT, makes a great case on how antenna efficiency can translate to enjoyment of amateur radio. I also am intrigued by Tom's experience with verticals on the beach for DX-peditions. According to Tom, a vertical on or close to sea-water can be as effective as a yagi. Tom was a former principal of Force 12 antennas. 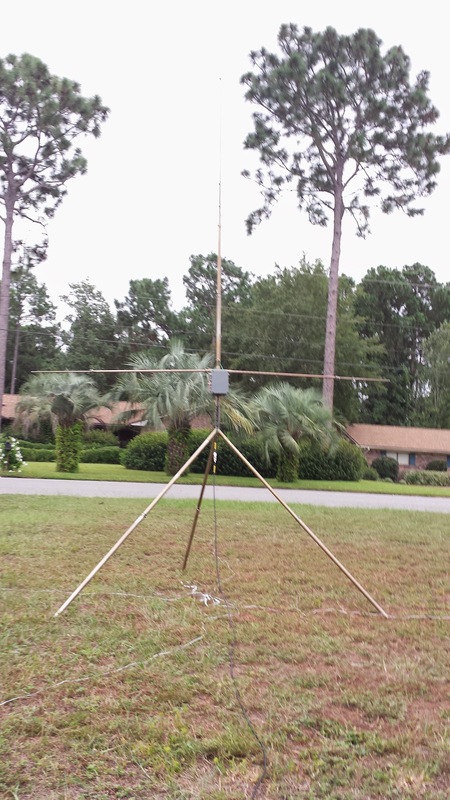 He now has his own line of antennas at N6BT.com. He has a Bravo line of vertical dipoles which is his improvement over the Force 12 Sigma line of vertical dipoles. I exchanged a few emails with Tom and he recommended the Bravo 7K for me. I decided to get one with the extended tripod legs, splash coating and a carry bag. It took about ten days to ship. Tom said he took a few days off due to the hot weather in California at that time. The antenna arrived exactly as ordered. I did a test assembly and it is mechanically sound. The vertical element and the two radials are nested lengths of tubing and these are extended to specified lengths and secured with hose clamps.You may think this antenna is a ground plane due to its appearance but Tom explains it is a vertical dipole. The Bravo 7K web page and users manual go into a lot of detail I will not repeat here. See more photos in this album. There is some work involved to assemble and set the antenna for a specific band. It covers 40 through 10 meters. The element lengths vary and there are coil setting which are done via jumpers. I have not timed it but I am thinking 10 to 15 minutes to setup the antenna and 3 to 5 minutes to change bands. So no armchair band switching here, you are required to get out of the chair. And you thought hams are sedentary. Perhaps 40 and 30 could use some coil tweaking. But for now I will leave well enough alone. I can use the KX3 internal tuner for SWR above 2.0. The measurements were made at the end of 30 feet of RG-8 coax. So I must say I am pleased. I was especially pleased to get a 589 on 40 CW from Ohio with 10 watts. 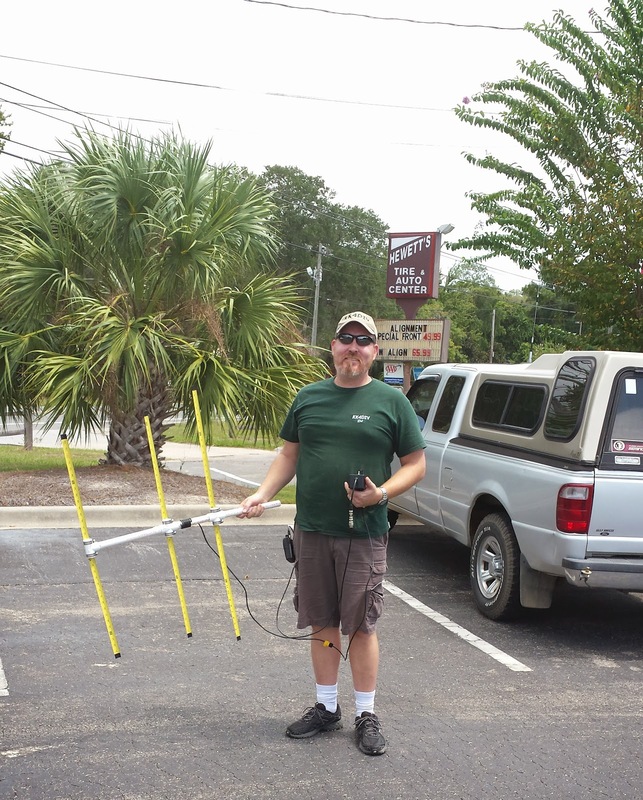 I do Rapid Deployment Amateur Radio (RaDAR). Will the Bravo 7K fit in? This is a tough call. It is not terribly heavy and fits into a nice bag. It is self supporting so no fiberglass poles to pack. The trade-off is the setup time and band change time verses the expected performance. It is hard to beat the quick band changes and portability of the Alexloop. We will keep pondering this one. But never less I expect to continue seeing what the Bravo 7K can do in my portable ops. 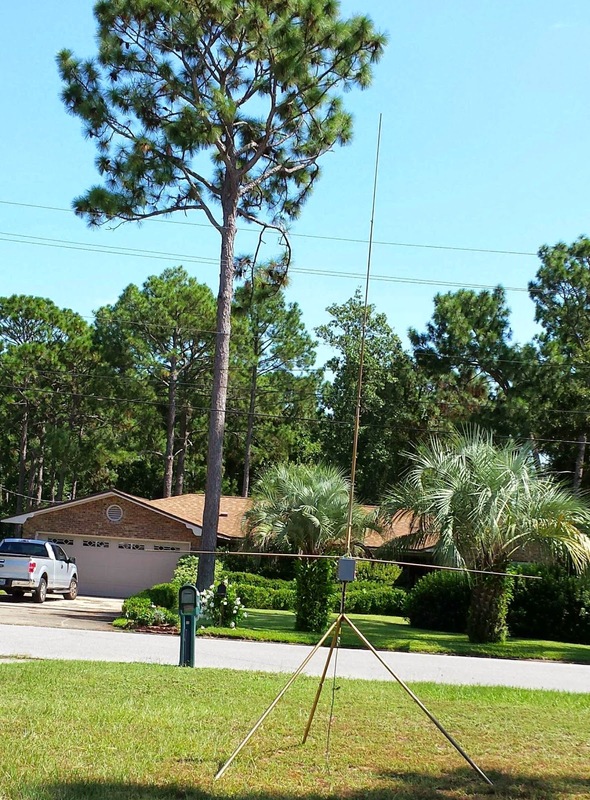 My goal this fall is to get this antenna out to the Gulf and bay side parks here in Northwest Florida. There I can explore its performance near salt water. Elecraft comes out with cool upgrades and accessories for their gear. You just have to wait a bit as they are busy folks. The promised 2 meter module for the KX3 is now available. 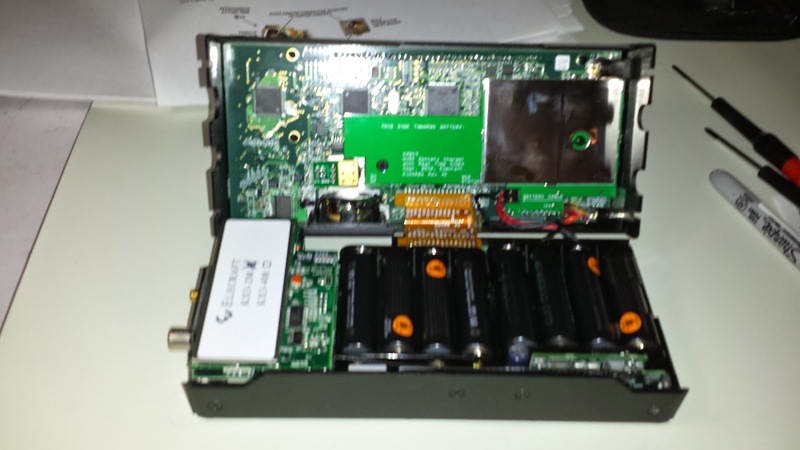 I started off this long weekend by installing a 2 meter module in the KX3. This of course is just following instructions. A return on this investment is using my KX3 on our local club fox hunts. The KX3 gives me an S meter which none of my HTs have. Fox hunting also known as hidden transmitter locating is often done on 2 meters. Directional antennas are used to get a bearing and signal strength on the fox. Actually spotting the fox is never as simple as it sounds. It takes some presence of mind to integrate the information you have and make your next move. Our club started out with site hunts and now is going to try vehicle hunts. I have a small loop and a four element yagi for hunting. I also have an offset attenuator which can reduce the fox signal to help get an accurate bearing. All this gear came from Arrow Antennas. A tape measure yagi however is inexpensive to build yourself. Sunday, I went out vehicle fox hunting with club members Bob KK4DIV and Phil N4STC. We took turns driving a couple of miles to hide the fox. Our fox is a PicCon from Byonics that generates tones and a Morse callsign ID. The PicCon is hooked to a Baofeng UV-5R and the antenna is a small mobile whip. 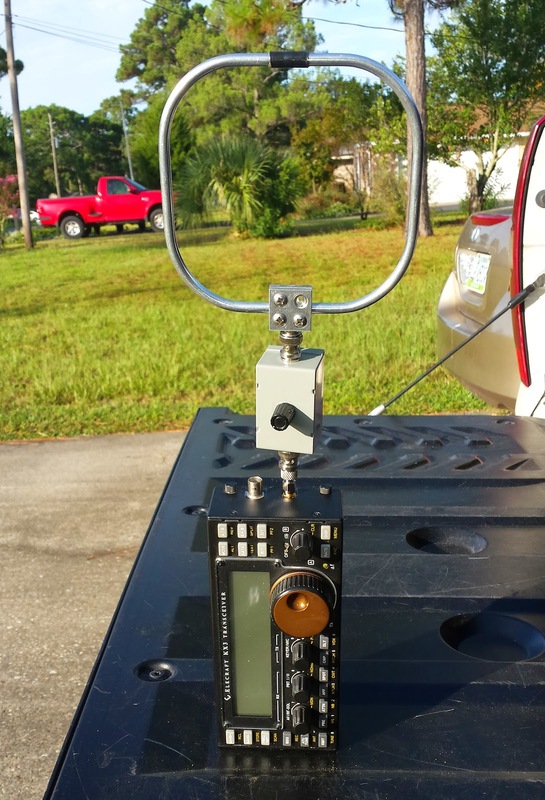 I used the yagi and KX3 to hunt with. I got good bearings but still took a while as I went the wrong way for one move. Bob has a tape measure yagi and Phil has a awesome multi element quad. Our club is planning a "for the record" vehicle hunt and picnic on September 13th. KX3 with 2 meter module. It is on the left side. KX3 with offset attenuator and directional loop. Phil N4STC and 6 element quad. Wow!